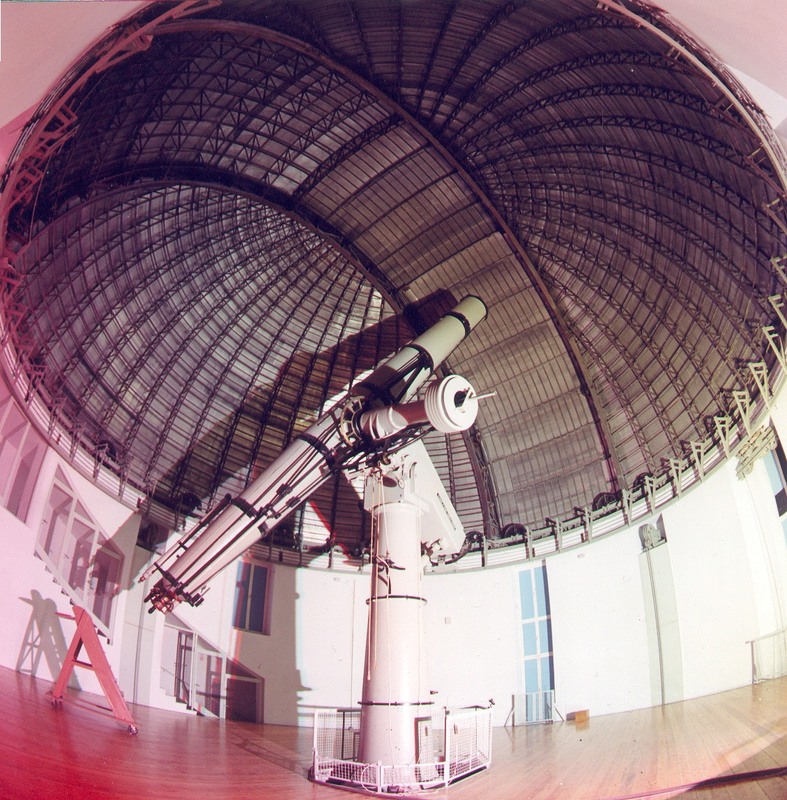 The Newall telescope is the most impressive instrument of the Observatory of Athens. It was named after Robert Stirling Newall (1812-1889), an amateur astronomer, who, due to his successful entrepreneurial activities in the field of steam engines and telegraphic wires, became rather affluent. In 1862, Newall discovers by change two large-sized crystals made of crown and flint glass, produced by Chance of Birmigham. He bought these and entrusted T. Cooke and Sons with the construction of the biggest refracting telescope of its time. The telescope was completed in 1869. The lens is 25 inches in diameter (62.5 cm). Its tube is cigar-shaped and it is approximately 9 meters long. The whole construct weighs 9 tons. It is equipped with three finder telescopes, two of which have a 10cm diameter and the third one a 15cm diameter. The instrument is so evenly balanced that, despite its weight, it can easily be moved by the observer. Its base is of German type, with hefty counter-weights, aiming circles and offers the ability to make fine adjustments of height and azimuth for its exact orientation. Unfortunately, for a variety of reasons, Newall himself did not used the telescope much. His son, Hugh Frank Newall, wishing to see the telescope utilised he made an offer to the University of Cambridge. He offered to assume the necessary cost, and to work for five years without payment as the main observer responsible for the telescope, provided that the University would offer him with a plot close to the telescope where he could build his residence. The University accepted his terms and the telescope moved to Cambridge at the end of 1891. From that year onwards and until 1911, Newall conducted a remarkable series of observations, mainly spectroscopic ones, with good results. F.J.M. Stratton continued his work after 1911 and the telescope knew days of glory until 1930, when it gradually became outdated as more advanced instruments appeared. Thus by the 1950s, it was hardly used and its future appeared gloomy. Its dome was defective by construction and due to its prolonged usage, it was rather hard to use. Given the situation, the management of the Observatory at Cambridge decided to donate the telescope to any Observatory that would be interested in having it. The National Observatory of Athens became aware of this in 1955 and a team of scientists was sent to Cambridge in order to evaluate the Newall. 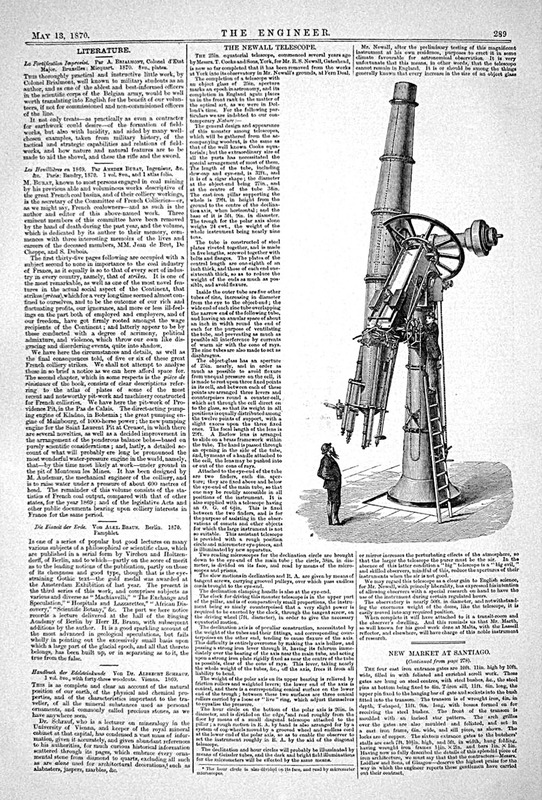 The Greek scientists decided that the telescope, though not utilised systematically, did not appear disused. Thus in 1957, the final decision to accept the donation was taken and the area of the “Koufos” hill bellow Pendeli mountain was designated for the installation of the telescope. The architect B. Kassandras drew up the architectural plan in accordance with the recommendations of Prof. Plakidis. The construction of the building started on 1957. At the centre of the ground floor stands a 5m tall concrete pyramid, on which the telescope rests. The observations are facilitated by a mobile floor, which can move vertically for approximately 5m, assisted by an electric mechanism installed in the concavity of the pyramid and by six makeweights, which slide into concavities in the wall. The rotating hemispheric dome that crowns the building has a 14m diameter.